Yeah, that's more what I'm getting at. Why would I, Joe Schmoe, buy into Goofy Robots the game in the hope that someday I'll have the option to buy, in addition to the blandest mechs, the one or two mechs I have seen before and perhaps formed a positive impression of? I'm glad you posted , because I wasn't sure how to respond to Judgedoug, although it was tempting to quote him, bold what I wrote, bold what he had written, and then image link an emoticon of someone unrolling his arm towards the post so that he's pointing at it with his whole flat hand. Yes, I agree it's a new sculpt and looks more like the existing lineart than the old sculpt ever did. There's just not enough evidence that it's received a full reworking by Shimmering-Sword. I have no idea one way or another. But they certainly have updated the mini. 1) The unseen weren't stolen. There are pages and pages of explanation about that tired subject on the internet, but the TL: DR is FASA didn't steal the unseen, they just licensed them from the wrong party. And 20+ years later, it looks like Harmony Gold might not have had the proper license either, but stop with the "stolen" BS. It is false. 2)This is pretty much as close to a full reboot as you are going to get unless you go for a different game system like the Clix attempt back in 2003. Some of the formerly "unseen" core designs are present in this box set for the first time since 1992, though dramatically redesigned. 3) It isn't the nostalgia so much as the rules and design bloat that needs to be addressed. There will always be diehards who prefer the Macross and Dougram designed `Mechs, or like the earlier eras but those players aren't necessarily dragging the game down. 34 years of unit and rules additions bolted on to a game system that was really only ever intended for lance on lance engagements is the problem. The sheer number of weapons systems, unit types, and unit designs makes this game extremely cumbersome, both as a new player and a retailer. Look at Iron Wind Metals catalog of Battletech miniatures and then imagine a store trying to stock even a quarter of them. The number of SKUs is insane! Which is great from a player/buyer perspective, but for retailers the line is too large and too niche to stock. Don't? If you don't like these `Mech designs, this game isn't for you. If you only like the MadCat/Timberwolf because you saw Mechwarrior 2 back in the day, you are out of luck I suppose. There is a gorgeous MadCat model available but it is sold in pewter so kryptonite for you. Though there are plenty of resin and 3D printed knock offs you can buy online so, maybe look at those alternatives instead? I do hope the maps that come with these are the same harder card style from the map packs they put out a few years ago, with the punch-out terrain hexes. Buying into HG's bull gak are we? "Why would I get into a game that has lots of things I don't like!" You wouldn't, because why would you intentionally start something that doesn't appeal to you. Stop asking the game to be something it's never been. You don't see me telling Warmachine to be something it's not because I don't find its aesthetic to be all that pleasing. I plan to buy both box sets and I really like the new models. I played the original, the Click version and the video games. I have a group that is in for playing this version too. I easily see them pushing the timeline forward and adding Clan mechs.....after they see how sales go. I can also see them be successful and divert more attention to the line. I just wish they could have this for sale now. The shiny new video game has been out for a few weeks. It made me want to play the tabletop version, and when I went to check it out: out of stock. Maybe I'll still be interested when it comes out, I most likely will be, but I was a 100% guaranteed sale this week, and that percentage may drop by the time this is on sale. I'm glad the mechs are getting modern designs. I've seen the old ones, and like Rogue Trader-era marines, they have not aged well. I AM SOOOOOOO PUMPED FOR THIS!!!! I think the issue with "iconic mechs" is that different people will have different opinions on it. What's iconic to the tabletop player won't be the same as what's iconic to the video game player. Gah, those print lines. I might just as well rip some models from MWO and print my own mechs if that's the quality I can expect from the new box. The two mechs that almost everyone knows are the Marauder and Battlemaster. Mine is the Battlemaster followed by the Griffin and Shadowhawk. Warhammer, that thing is very well known. I just wish they could have this for sale now. Or like, up to three years ago. As Albertorius pointed out, this isn't exactly new news. Aries has had these up for preorder on their site, with these pics, for a long while now. I can't even remember how long ago I originally saw them. And who knows how long it will actually be until CGL gets around to shipping them. I think the issue with "iconic mechs" is that different people will have different opinions on it. Generally, I think "iconic" means Fourth Succession War and before Clan Invasion. Honestly, I most hope that this streamlined starter set works out for them. I think their plastic supply is pretty good- I haven't heard of any issues acquiring the Alpha Strike boxes. Now imagine us going forward- and each era getting a starter book with some plastic minis and a micro campaign, like Sword and Dragon, or Wolf and Blake. Styled after the GW event boxes, or the many, many, kickstarter board games, it could be a really awesome way to provide multiple entry points or campaign ideas for veterans. I'd even be cool with two iconic plastic mechs in the Era Starter boxes, and some cardboard for the lancemates- and of course, an Alpha Strike box of appropriate era to flesh out each side. I agree. I remember seeing many of these mechs in an old Japanese model catalog back in the early 80s. 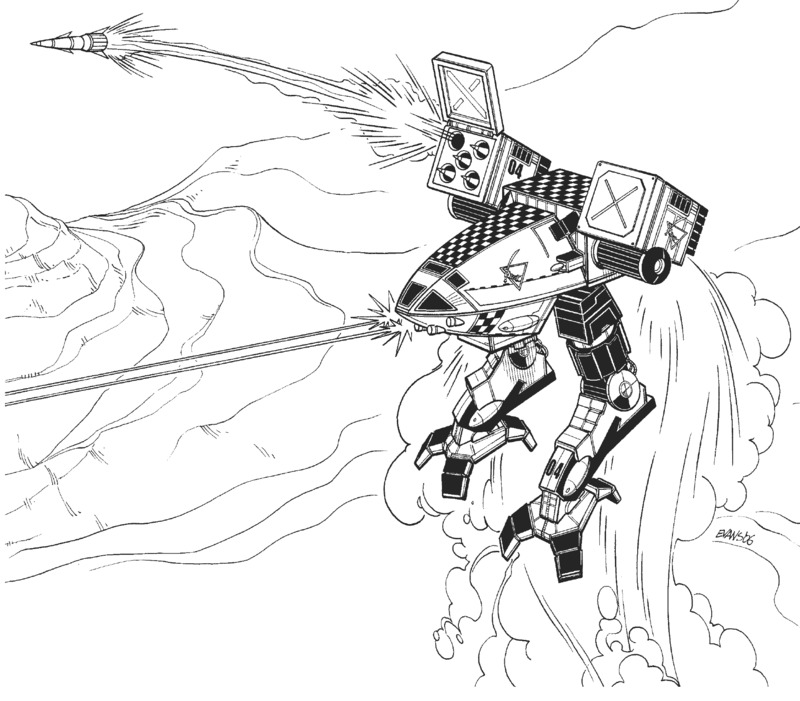 I'm also certain I saw the Warhammer in Robotech, (first season). Will have to get these. For me, it's the Axman. Purely thanks to the Animated Series, of course. For me it was the Mad Cat, or as I knew it at the time, the Timber Wolf, playing the Mechwarrior 2 demo that came on the Win 95 demo disk on my Pentium 166. I didn't even know what the 'Inner Sphere' was. I didn't understand any of it. Only really got into that later when MechCommander came out. Some people hate the old art style ("They haven't aged well!") whereas others accept it for what it is. I appreciate what PGI has done with a lot of the modern redesigns, but not all of them are hits to me (the new Wolverine is far too generic, and I think the new Centurion ruins the image of the Centurion). I just love BTech the game. It was my super-crunchy escape from the simplicity of 40K. It was the game I played when I wanted to play a rule set with actual depth. It was also the one with an advancing story, rather than 40K which was just a setting (until recently). Then again I'm one of those BTech players who doesn't hold onto their fav time period like their lives depended on it, calling anyone who liked the Clan Invasion/FedCom Civil War/Jihad an idiot. I like it all - not equally - but don't sit around wishing that the Jihad had never happened or that the Clans ruined everything. Not gonna lie, I kinda liked the Dark Age, so count me amongst the fans of the advancing story, too. Yeah I'm not just a CJF fan but a Mongol. All hail Malvina! That said, I totally get why people think introducing the Clans spoiled some of the fun. Seeing as it’s a prototype I wouldn’t judge just yet. I love that Awesome, the Awesome along with the Zeus where two of my fav mechs. As to the beginner box are they going with the Grey Death Legion Mercs because they where the one who found the Star League era computer core and sent all the tech info into the inner sphere so the inner sphere could fight back against the Clan invasion? I know right? I mean, having a game in print, with a demo edition for new people to dip their toes in, with a whole new set of 'Mechs, maps, rules and accessories. They're just leaping backwards. I have a coin dispenser with each coin bearing an arrow and a number, in case of "sudden interlopers" during friendly games. If I'm judging. Nothing makes enemies friends like a surprise atlas. It is a tad more probable that they would make them out of the same stuff they did the latest box and the lance pack ones. Seeing as those seem to be official promotional images delivered by Catalyst, I think I'll judge. Don't mind me, thinking about the continuous failure to properly leverage the visual side of the IP in tabletop products makes me cranky. You'll judge the final product on a picture of a prototype?